Two months ago, I introduced the chart I call the Ice Cube Road. As promised, below is an update, showing the standings of the National Hockey Leagues Atlantic Division through Sundays games. Philadelphia leads. 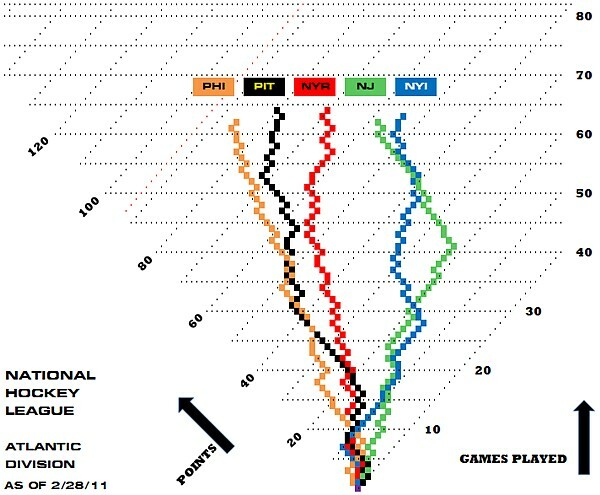 Second-place Pittsburgh has a mediocre record lately, as do the two New York teams. But after a terrible start, New Jersey's surge over the last 20 games has lifted the Devils out of the cellar. Ill have a final update at the end of the regular season in April. A week ago, I tuned in early to the Daytona 500 telecast, thinking Id hear an explanation of the radical new drafting style that all the NASCAR drivers were using. In past years theyd circle the tri-oval in large packs, 10 or 15 feet apart. This year theyve decided to pair up into two-car tandems with the pusher in back practically touching the bumper of the leader in front. Although it looks weird, two cars hooked up in this fashion reportedly can reach speeds nearly 15 miles per hour faster than they can separately. But why is this drafting method better than the old drafting method? Broadcasters on past auto races have gone into great detail about cockpit instrumentation, spoiler angles, tire compounds, and other minutiae, so I was hoping for a technical explanation for the new technique. Had the cars aerodynamic package changed that much from the 2010 season? No, the only reason offered was that the track at Daytona had been repaved. Why should new asphalt cause the drivers to pair up? It wasnt until I received Sports Illustrated later in the week that I was enlightened. Kurt Busch discovered in 2007 that these two-car drafts are more efficient at superspeedways like Daytona and Talladega. However, four years ago it was impossible to maintain a tight formation all the way around the track. The turns were too bumpy and slick. The cars bounced and slid around, and the drivers had to back off on the throttle. But now the smoother surface at Daytona has removed those difficulties. So this year, instead of watching a string of brightly colored atoms, we saw a bunch of diatomic molecules. Viewing the cars head-on, it was hard to tell that there was a pusher hidden behind each leader. And from inside the cars, the driver of the pusher couldnt see where the pair was going. 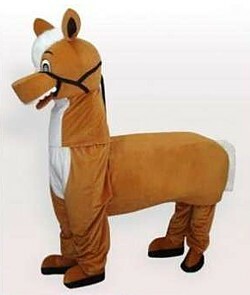 He was like the guy bent over in the back half of a horse costume. Spotters had to constantly communicate via radio with their drivers, steering them by voice communications  a real mental strain over 500 miles. Twenty-year-old Trevor Bayne was in the lead coming off the final turn as the tandems finally broke up in an every-man-for-himself dash to the checkered flag. I think one of the TV announcers shouted that the pairs had switched and now Baynes pusher was Carl Edwards. To me, it didnt appear that way. Edwards wasnt helping Bayne; instead, he was trying to pass him on the inside, but Bayne slid down in front of Edwards to block his passage. Bayne won, and the celebrations began. Once again the broadcasters let me down. The race had run longer than anticipated, and when it was over it seemed that the replay technicians had gone home. Through interview after interview, no taped footage was shown. I wanted to see those decisive final seconds again. Finally, I realized that I was watching through a cable box with a DVR, and I could rewind the telecast myself. I spun back ten minutes or so and, in slow motion, watched Bayne hang onto the lead and take the flag. Before the next race at Daytona, maybe they should re-install a few potholes to keep pairs of cars from gluing themselves together. It just doesnt seem right. FEBRUARY 22, 2011 THEY'RE ON THE ROOF! 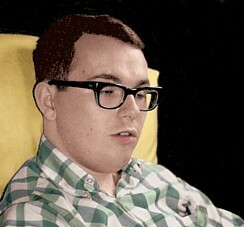 Terry, my high school classmate who died in 2006, liked to talk. If he saw a movie and you didnt, hed describe the plot in great detail. Once he had a dream and I didnt, so he told me the story and I wrote it down. Its the 100 Moons article for February. I can empathize. I've had the same scary experience twice, though fortunately not while on the air. When I was a toddler, I programmed a part of my brain to associate words like Mommy with the vocal contortions necessary to produce sounds like Muh, aw, muh, ee. Thus I learned to speak. The brain app automatically converts words to speech without further effort on my part. However, a couple of times in 1971, it suffered a power shortage and began outputting gibberish. I wanted to say Check and what I heard coming out of my mouth was Chart. The only way I could produce the words I wanted was by bypassing the malfunctioning software and consciously speaking Each Sound separately, as in Eee, ch, Sss, ow, und. So I shut up for a few minutes while my brain rebooted, and afterwards everything was normal. I described the episodes to our family doctor, Dr. C.W. Holcomb, who basically said there was nothing that could be done. Ive also had another symptom of complex migraines, the aura. I first noticed this problem when I was 18 years old, and I still experience it a few times a year. It starts with pulsing fuzzy yellow dots in the central part of my vision. (Psychedelic, man!) Over the course of 20 minutes or so, the dots migrate to the outer edges of my vision and then off the screen. One time, the aura hit me as I was reading teletype copy aloud on a radio newscast. It wasnt easy to decipher the faint purple type on yellow paper, obscured as it was by grainy yellow dots, but I managed by looking off-center and using my peripheral vision. Some years later, I recall that a Pittsburgh Pirates infielder  I think it was Jay Bell  had to be scratched from a scheduled start because he was experiencing an aura. You dont want to be catching a hard-hit baseball if you cant distinguish it from the other dots of light. Im fortunate that, for me, none of these migraine episodes is accompanied by the traditional excruciating headache. I rarely get headaches of any kind. A couple of days ago, Scott Spears of WMRN radio in Marion, Ohio, taped a 15-minute telephone interview with me about The Sally Flowers Show. Unfortunately, I have only five minutes of memories about this program from 40 years ago. It was a morning talk show that aired on Marion CATVs channel 3. I was the guy in the control room, and we basically just turned the cameras on Sally and let her do her thing. However, I do recall that Sally was very good at what she did. In the early years of television, she had been a beloved personality in the big city of Columbus. In 1970, we were lucky to get her to present a daily show in our small city of Marion, even if it was for only about four months. Like her fellow TV pioneer Arthur Godfrey, Sally ad-libbed her commercials, simply telling her viewers about the sponsors. And like Godfrey and more recent performers such as Craig Ferguson, she related directly to her audience, speaking to the camera as though it were a real person. When she was conversing with you through the TV screen, you couldnt take your eyes off her. When I was a young graphics operator, television used standard fonts. If a long name wouldnt fit, we had to abbreviate. Watching ABCs telecast of the 1984 Olympics in Los Angeles, I first saw the alternative: substitute a compressed font for long names. However, they still used the standard font for short names. I didnt like this inconsistency, and I mentioned it to another operator later that year. Then I discovered that he had been the one who came up with the idea! Nowadays, if we graphics operators type too many letters in a given space, the character generator makes our words fit by automatically compressing the font as much as necessary. Variable aspect ratios have become so common in TV graphics that we no longer notice them. In a new article, I attempt to adopt an Irish persona as I give a fanciful explanation of How Tomorrow Came To Be. Is America exceptional? The majority likes to think so. Does everything happen for a reason? The majority likes to think so. However, many educated people know better. I'm going to recommend the Mediocrity Principle. It's fundamental to science, and it's also one of the most contentious, difficult concepts for many people to grasp. And opposition to the Mediocrity Principle is one of the major linchpins of religion and creationism and jingoism and failed social policies. There are a lot of cognitive ills that would be neatly wrapped up and easily disposed of if only everyone understood this one simple idea. The Mediocrity Principle simply states that YOU AREN'T SPECIAL. and that tuna sandwich you had for lunch was not plotting to give you indigestion. Most of what happens in the world is just a consequence of natural, universal laws  laws that apply everywhere and to everything, with no special exemptions or amplifications for your benefit  given variety by the input of chance. Everything that you as a human being consider cosmically important is an accident. None of which is to say that life is devoid of purpose and meaning, only that purpose and meaning are things we create  not things we discover out there in the fundamental architecture of the world. The world keeps happening, in accordance with its rules; it's up to us to make sense of it and give it value. Each year, the Social Security Administration prepares us for retirement by mailing us a lifetime summary of our annual earnings. Out of curiosity, I graphed my numbers (blue line). I also adjusted them for inflation based on what a dollar was worth in 1983; the following discussion refers to these constant dollars (red line). I was employed for an entire year for the first time in 1971. The next year, Marion CATV paid me $20,647 in constant dollars. But then overtime was curtailed. Although I continued working in local cable TV for the next decade, I never topped $20,000 again, and there was a dip in earnings in 1980 when I was between jobs for several months. In 1982, as local origination job opportunities were fading away, I moved on to regional sports remote telecasts, the next level (yellow tint). Ive been fortunate to be employed in this line of work ever since. My earnings peaked at $28,663 in 1988, the first year that I worked full-time as a freelancer. 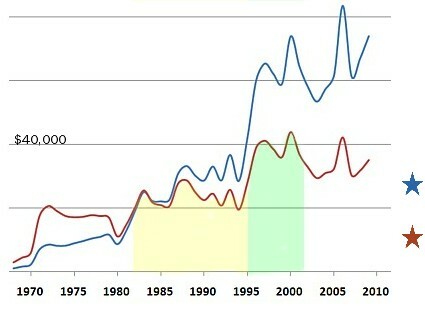 I didnt reach the third level of income (green tint) until the second half of the 1990s. Thats when I traveled a lot for Fox Sports Nets national telecasts, making $43,820 in 2000. Since 2002 Ive been working mostly around Pittsburgh (no tint). The only year I approached the 2000 earnings record was 2006, when I traveled with the Pirates for ten weeks of nonstop baseball. So theres my 40-year career in one graph. What does it all mean? Well, if I retire a couple of years from now, Social Security will send me monthly checks totaling $24,000 per year (blue star), which will be worth about $11,000 in 1983 dollars (red star). Until they run out of money, that is. Bus trips in January are not always enjoyable. On the lakefront in Cleveland, the wind chill was 22 degrees below zero on the night of January 4, 1968. The Oberlin College basketball team hurriedly filed out of their motor coach and into a restaurant for a postgame meal to celebrate their first win of the season. As a member of the broadcast crew, I was with them. Two nights later, following a loss, a snowstorm was raging on Interstate 71. Again I was with the team as a 120-mile journey from Columbus back to Oberlin took more than an hour longer than usual. These details come from a letter I wrote the next day. In this months 100 Moons article, I describe even more winter basketball trips. Two parallel columns take you inside a high school team bus and the NBA champions team bus. Here are a couple of photos I took today, only five miles from my apartment. 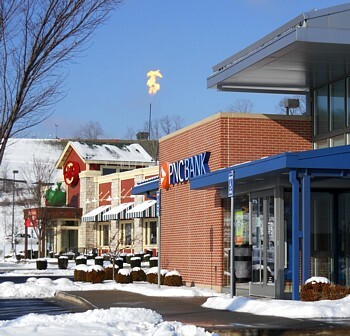 A Marcellus shale natural gas well has recently been drilled on a hillside farm overlooking the Pittsburgh Mills shopping mall. 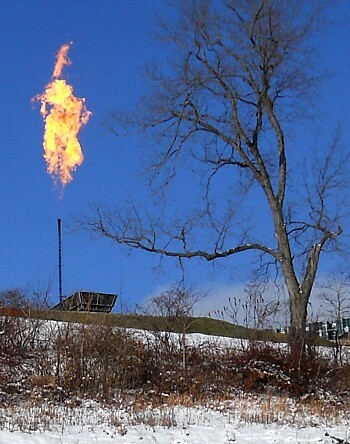 The fracking process has been completed, gas is flowing, and now the wellhead is being flared. Looming ominously over the shopping mall is a brilliant pillar of fire. By night, it illuminates the parking lots with its flickering orange glow, which can be seen from many parts of the valley. Gases escaping at high speed produce a constant roar like a taxiing jet aircraft. But were told its all under control. The local newspaper explains that flaring is a safe way of burning off the initial gases rather than letting them vent into the atmosphere. Testing should be complete in another day or so, they tell us. Then theyll start collecting the natural gas for use, rather than just letting it escape, and local shoppers will no longer cower in fear beneath the Olympic-size flame. Sometimes on a summer evening, while my father was working late, my mother and I would drive over to Richwood Lake to take in a youth baseball game. 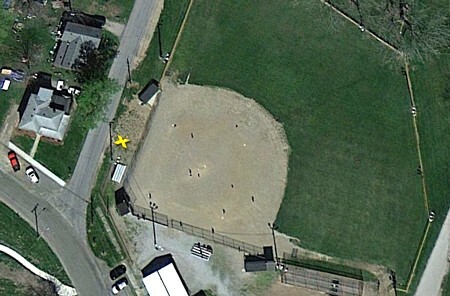 The ballfield is located at the south end of the park, bounded on the west by Lynn Street. Wed pull off and park on the berm, facing the field. From our vantage point (the yellow X), behind and a little above the third-base bench, we could watch the game through the cars windshield. We had great seats in our private box, which was much more comfortable than the four rows of wooden bleachers off to our right. Other spectators did likewise, including some who parked behind the outfield fence. If they forgot to turn their headlights off, the umpire had to halt the game momentarily. Half a mile away, the tradition continues at the softball diamond behind North Union High School. 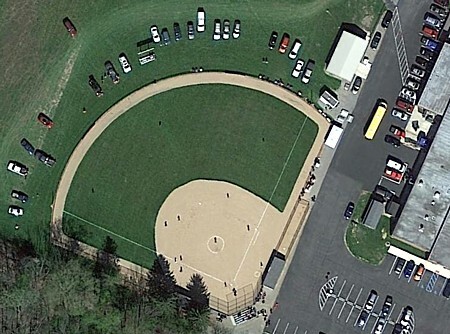 Most parents seem to treat this field too as a drive-in venue, preferring to watch from their cars parked beyond the outfield fence (center field distance 210') rather than sit on a hard plank in the tiny set of bleachers behind the backstop. I recently ran across a note from the mother of one of my classmates, describing how village residents also sat in their cars to watch another spectacle  one that took place downtown every Saturday night. Ive added it to this article. And Ive updated a couple of other articles.  A hundred years ago, a Richwood inventor explained his motivation. Click here.  More than 40 years ago, I suggested that laboratory scientists could judge how much pain a mouse is feeling by looking at the expression on his face. Now theyve finally taken my suggestion. Click here. That radio commercial might have made sense when it was written in late August. But its still running when State U plays its bowl game in early January. Why hasnt the sponsor updated the script? He doesnt care. He bought the air time not to deliver timely sales messages but merely to identify with the popular football team. In this sort of small-scale broadcasting, many corners are cut. Consider parades. When telecasting a parade, the producer typically assembles big loose-leaf binders with one page describing each unit; the announcers can read from these script books, adding ad-libs and trading comments. However, Ive been involved in telecasts of local parades in which the video crew merely cuts from one interesting shot to the next one they find, leaving the announcers to follow along in their scripts as best they can. Not infrequently, an announcer hasnt finished telling a story about one unit when the next unit inexplicably appears on the screen. As is my custom, I watched the Tournament of Roses parade yesterday. I used three TVs. The audio was out of sync on KTLAs coverage on the Hallmark Channel, so I put them on my tertiary set; floats showed up about a minute later than they did on the other networks, because their camera position was around the corner on Colorado Boulevard. On my secondary HD screen, I watched ABC and NBC, switching during commercial breaks. And on my primary HD screen was the uninterrupted coverage of HGTV. This was not small-scale broadcasting. HGTV, in particular, did it right. I reconstruct yesterdays telecast like this. When the producer decided it was time to proceed to unit 37, he told the announcers to wrap up their comments about unit 36. As soon as they did, the director put a wide shot of 37 on the air, and the host read the first paragraph identifying the unit. Meanwhile the assistant director assigned other cameras to find certain details: Camera 5 show me one of the wheels, Camera 3 shoot the chimney, Camera 6 get the eagle in the back. The co-host then read the second paragraph mentioning these features, and the director cut to the camera shots at the appropriate times. It sounds very simple. But, as I say, this common-sense plan is not always followed on smaller telecasts. And the smaller telecasts dont always have the resources to nail down all the finer points. On September 30, 1978, I was part of a local telecast of a firemens parade in Washington, Pennsylvania. Many of our script pages were extremely sketchy, because, for example, the leader of the Boy Scout troop had never responded to our letter asking for information. But we did receive a plethora of information about one unit: an antique fire engine. This steam-powered pumper was pulled by a team of four horses. Jerry Polen and I were prepared to describe its history and to point out the brass fittings. We were prepared to identify the man driving the horses. We had the names of all the firemen who were riding along. We even had the name of the Dalmatian. But when the engine neared our camera at the reviewing stand in front of the courthouse, the driver gave the crowd a thrill by urging the horses into a gallop as though they were racing to a fire. The engine clanged past us and was out of our view within five seconds. Oh, well.